LEGRI was proposed in response to the Spanish Instituto Nacional de Technicas Aerospaciales (INTA) 1993 call for proposals for the first MINISAT mission (MSAT1). The aim of the proposed mission is the demonstration of the technological feasibility of the construction of new generation gamma-ray telescopes, optimized for low energy (10-100 keV) astronomy, using 80 HgI2 detectors and 20 CZT pixels, The Group was involved in developing the detectors. This material provides an excellent response in the 10-100 keV range, with the best presently achieved efficiency/volume ratio. The 10-100 keV region contains unique, not fully explored, astrophysical information regarding nuclear excitation processes, radioactivity, cyclotron emission and absorption processes. 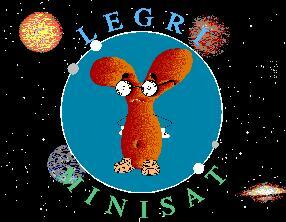 LEGRI was successfully launched on April 21st, 1997, on a Pegasus XL rocket. The instrument was activated on May 19, 1997. The technical evaluation as well as the scientific analysis is ongoing. One of the technical mission goals is the measurement of the particle and gamma induced background levels. These are higher than anticipated beforehand. The first image of an observation of the Crab field. The LEGRI home page at Grupo de Astronomma y Ciencias del Espacio.